Before Warhammer, Dragon Warriors and Maelstrom, there was the ironically-titled Heroes, written by Dave Millward (with 18 months playtesting), with art by John Blanche (artist responsible for the UK Holmes D&D cover). A roleplaying game set in the Dark Ages, 80 pages cover character creation and background, professions, equipment, combat, social interaction and advancement, scenario creation, religion, gambling, crime and punishment, political wrangling, land holdings, piracy, naval campaigns, commerce, raiding, medicine and healing. There is also a European-style setting, the Ouesterlands, included. Mostly it's carousing (or else you lose experience points), whoring (ditto) and fighting. Rabid dogs, floods and blizzards , venereal disease and mutilation. No fantasy, no magic, just blood 'n' snot brawling with percentile dice. 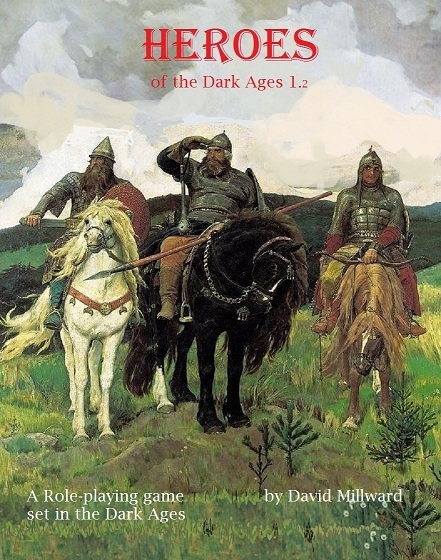 Mr Millward has just released a new edition of the game, now entitled Heroes of the Dark Ages, which is available for sale as a 120-page book with a version of the game's original map. This is great news for anyone interested in early roleplaying games, especially those produced outside of North America. I don't believe PDFs are currently available, only print, but who knows what the future holds? I have my copy of the original by on my desk as I write. It's often within my reach - the setting is excellent. I do hope the rules gave been reworked: the original rules are very, very dated. Brit games of that era seemed to be a little confused about whether they were RPGs, skirmish games or something else (cf Laserburn and, a few years later, the original Warhammer). Heroes was probably the most ambitious: a one-on-one fighting system, a mass combat system, political and social climbing, trading rules, piracy and raiding, city encounters, overland encounters, and all within a slim rulebook. Trouble was, the rules weren't very user friendly and contradictory in places. Heroes was a gem, but a flawed one. Interesting but the price is way too high. And without a pdf preview...that's not something I would buy. This new edition seems to make the rules more clear and less confusing. Now I'm definitely interested. I've never heard of it, but I'm intrigued! Seems weird to think of wanting a rpg without some sort of creatures in it. Just cant wrap my brain around that for some reason..
Hm...404 on that link. Hopefully just temporary problems. If one were pulling together a fantasy 6th century Europe homebrew setting, is there enough "dark ages" material in Heroes to make it worth picking up as a reference?